Baby Milk Action has been asked to clarify whether end-of-aisle displays of infant formula and other breastmilk substitutes break the UK law and/or international marketing standards. The use of such displays appears to have become commonplace in supermarkets in recent weeks and months. The example below is from a Boots pharmacy in the UK (Cardiff, 7 August 2016). The UK regulations do not prohibit promotion of breastmilk substitutes other than infant formula. However, the Guidance Notes from the Department of Health on how they should be interpreted state that infant formula and follow-on formula should not be displayed together. 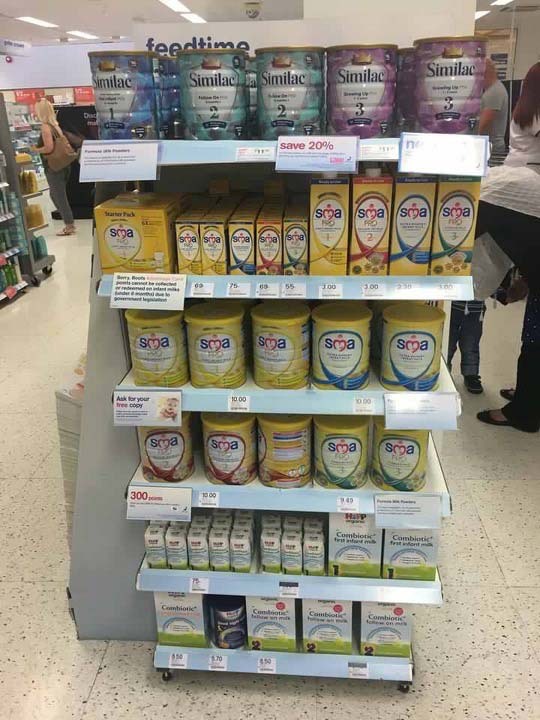 In the example above, Boots has included infant formula in the special display. This may be difficult to notice as manufacturers use virtually identical labelling for all formulas in the range to make them cross promotional. This is prohibited by the UK law, as explained by the Guidance Notes. It is important to remember that breastmilk substitutes are legitimate products and there is no problem with retailers having them on the shelves. The question is: does an end-of-aisle display constitute a special display designed to promote sales? When companies pay retailers to place their products in end-of-aisle displays this adds to the cost of formula. If companies abided by the marketing rules, formula would still be readily available for parents who use it, but would be permanently cheaper. While breastmilk substitutes may not be impulse purchases in the same way as chocolate or alcohol, they are high-margin products. Prominent placement is part of the “just in case” marketing strategy used by many formula companies. 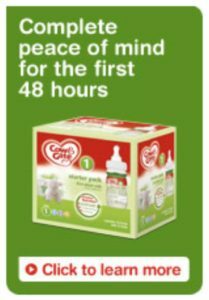 Another example of this are the “starter packs” companies promote for “peace of mind”, as in the example left of a Danone email sent to pregnant women, timed to their due dates. Most mothers in the UK say they wanted to breastfeed for longer. If companies did not prey on possible difficulties, many more may be able to do so. Mothers who want to buy formula will be able to find it in the baby section without use of special displays. Research has shown that “End-of-aisle” display “boosts sales” (Press Association report). 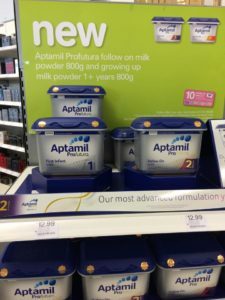 Use of this sale promotion strategy for breastmilk substitutes in the UK was particularly noticeable while retailers were trying to clear stocks of Nestlé SMA formula with “protein in excess of requirements”. 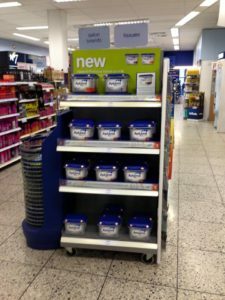 Nestlé was launching its new “SMA PRO” formula and retailers used illegal clearance displays and price cuts to try to shift stocks of the current infant formula. While no prosecutions were brought, exposure by Baby Milk Action and a campaign in Parliament highlighted that companies were breaking the law with these promotions. Danone, the world’s second largest baby milk company, competes fiercely with Nestlé, the largest. It launched its own new formula, called Aptamil PRO, using end-of-aisle special displays in Boots. 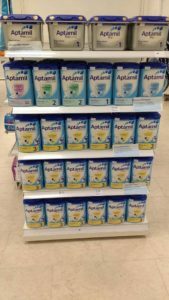 Infant formula was included in the special displays across the Boots network, judging by the reports we received from supporters around the country. When challenged, the Boots managers said it had been included in error. Three examples from February and March 2016 (left to right: Mild, Liverpool and Stamford). Companies have defended “end-of-aisle” displays, but they clearly are special displays intended to induce sales and so prohibited by the law and the Code. Baby Milk Action will continue to report cases to the enforcement authorities and call for action to be taken. Join Baby Milk Action – membership fees are essential for funding our work. Donate – any amount, even the price of a cup of coffee, will help.